Lawyers representing seven Chinese nationals who stand accused of money laundering and possessing more than 20kg of rhino horn pieces worth a combined $1 million want their clients' case referred to the High Court for review of a Hwange magistrates' court dismissal of their application for discharge. Two weeks ago, magistrate Collet Ncube ruled that the seven should stand trial. This was after their lawyers had made an application for dismissal at the end of the state's case, arguing that the state had failed prove a prime facie case against them. One lawyer, Martin Chasakara on Tuesday told the court that they were filing an application before the High Court on Wednesday to challenge the lower court's ruling. Chasakara also told court that the defence counsel was also going to file an urgent chamber application on Thursday at the High Court for stay of prosecution, pending the High Court's ruling. Magistrate Ncube did not object to the application. He ruled that if the Chinese nationals' lawyers fail to file their papers at the High Court by the 25th of this month, the case will proceed to be heard on the same date. The state, represented by Martha Cheda, did not oppose the request. The seven Chinese national have been languishing in remand prison since December last year when they were arrested. 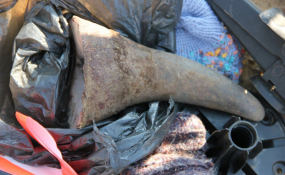 Zeng Dengui (35) ,Peicon Jang (35) , Liu Cheng (23) ,Yu Xian (25) , Yong Zhu (25) ,Chen Zhiangfu (30) and Quil Jinchang (29) were arrested December 23 after being found in possession of several pieces of rhino horns weighing 20, 98kg. One of the lawyers, Givemore Muvhiringi told NewZimbabwe.com that they will be filing their papers at the Bulawayo High Court on Wednesday.